Sheen Falls Lodge is a luxurious five-star hotel set amidst 300 acres of magnificent woodland, overlooking the picturesque Sheen Falls. It’s renowned for its 2AA Rosette restaurant and luxurious rooms, suites and villas. Set on the Wild Atlantic Way, outside the town of Kenmare, Co. Kerry, Sheen Falls Lodge is an unforgettable base for your Irish holiday, providing the highest levels of hospitality. Easanna Spa provides a light, serene and stylish environment where your top-to-toe journey of relaxation awaits. 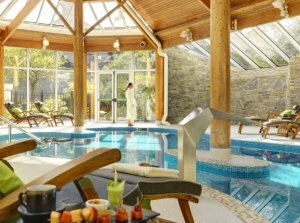 Wash away the day with a Jacuzzi, sauna and steam room, or simply recline around the stylish indoor heated pool. A fitness suite is available for guests on a complimentary basis and is open 24 hours a day. Their wide range of holistic treatments and beauty therapies use Voya and Elemis products, guaranteed to leave you feeling leave feeling refreshed, revitalised and completely pampered. The prize is valid for one year from the date of issue, and cant be used during the months of June – August inclusive. Other black out dates include bank holiday weekends and Christmas/New Year period.